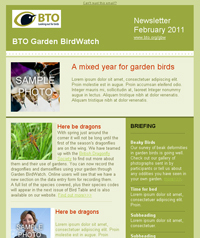 The Garden BirdWatch e-newsletter was launched in 2011 and is sent out to our network of Garden BirdWatchers, and other interested folk, on a monthly basis (near the end of each month). Each issue keeps readers up to date with the latest news about garden birds and also features lots of your stories from gardens. Subscribe to our e-newsletter (you can choose to unsubscribe at any time).